Are you a payooner user? If yes, did you apply for Payoneer MasterCard using the method of free shipping? Has the given date reached and pass, and yet nothing has arrived to the location provided by you during application? The very solutions to they mistakes you are making or on the verge to make is provided here for such issue. Just seat tite and read down to see how to apply the solutions for your card to get to you. For those new to Payoneer, it is an online account accessible to all, in which you can use to make or receive payments online. Also having the payoneer MasterCard, the one shipped to you after registration, one can be able to withdraw money with it from his or her account via any ATM machine in any Bank, if you only have the payoneer Card. √ You Might Like To See Our Simplified Guide On How To Create A Payoneer Account. 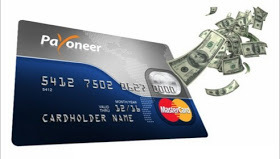 √ And How To Transfer Fund From One Payoneer Account To Another. It used to be, after registration when the customer must have provided the shipping address in which the card will be delivered to him or her. Then Payoneer will send the person an email which contains the information for the stipulated period for the arrival of the MasterCard. Let's assume you applied from your payoneer's account in order to get your own MasterCard within the month of May (i.e from 1st of May, then you should expect it to arrive to your location from 20th to 28th days of that same month). But due to misplacements or hitches from here and there and bad mailing system from any country you are from, you might end up waiting for over or more than 6weeks without any show of arrival. Even when the date was given, still nothing showed up on that particular date. Most of us must have waited and for so long and nothing seems to show up, below are most of they possible causes and solutions on how to deal with such issues. Reasons Why Your Card Wasn't Delivered To The Provided Location You Gave? ==>1. First, is as a result of Bad mailing system in the country you provided its address. ==>2. Mistakes on address format you gave during the course of registration, and also wrong Zip/postal code. ==>3. Its likely to be that your MasterCard arrived to the address you provided, may be probably your home. But due to the fact that, you weren't around at that moment as at the time the post man got to your resident. And no one arround to hand over the card to keep for you. The post man goes back with it, this is as a result of no number disclosed, because it came with free shipping. So don't in anyway expect the post man to call your phone number (line). ==>4. The Mastercard might still be on the way coming, maybe, it might have been delayed for any reason by payoneer. ==>1. How painful it might be if the parcel that contains the free shipped card is not registered. Thereby leaving it to be impossible to track. So the work you only got to do, is to be patients in waiting, although it may last longer at times, something like 6weeks and above. However, after you must have waited, nothing still showed up on the delivery address. ==>2. Then do well by going to the post office near the address you provided for the shipping card, When you get there, enquire for the card. ==>3. Once you are registered with payoneer, you are entitled to free 3 card slots. So should in case the first card didn't get to you, just login to your Payoneer account. and order for another one for free. And if the card didn't get to you again, then goto the next option. ==>4. This time, you need to do it right no matter what. Now, you should contact payoneer customer service via mail or get to them through Live chat. ( they are good at their jobs and they attends to their customer's needs in a good manner of approach). Chat with them on the issue concerning your card and also tell them that you want to request for another Mastercard. But this time, need to use the method of P.O Box for delivery instead of the normal home address and postal/zip code used before. When requesting for the method you like them to deliver your MasterCard as in the method of P.O Box. Just keep your credentials/documents close because you will be asked of those things which may include, Phone number, the one used in creating your payoneer account, also National I.D number, or Drivers license number ( Note: the ones that they will ask for should be the documents you provided during the first application) Do you get? Also never to forget, if you used travel passport identification, such will be asked too, so keep all close. TIP: You may not have a P.O Box. But find someone that has it, and collect the details about it on the followings; the P.O Box number, city where it is located and the country. The above three things are what you need which they may likely ask you. Don't forge details, use your own personal details for it (like real name, etc) as the recipient of the card. The P.O Box method of delivery is better because, you may have the details of your home address correctly, but only end up arranging them wrongly ( From wrong format) and that makes your payoneer Mastercard not to reach you. =>5. lastly, Have you exhausted the free delivery options for your payoneer MasterCard? If yes, then you have no other choice than to go for the expedite shipping via DHL. By this, you are required to pay $50 which must be available in the account you want to receive it's MasterCard. The shipping doesn't take long days to arrive, just 4 to 7days it will get to your doorstep. Here, you are expected to receive a call from DHL in other for you to collect the card. (Note, let your identification I.D be with you because, it might be needed before handling the Parcel over to you by the post man). Note: To get a sufficient balance for the expedite shipping, there are several ways to get the amount and much more than that in your payoneer account. You can choose to go by paying another payoneer user in Naira and that person will in return transfer the agreed amount in dollars to your payoneer account (work of payoneer dollar exchangers). Or you can go by means of working with payoneer partnered advertisers/publishers companies like adf.ly, fiverr, revenuehit etc and get paid to your payoneer online account. Even as that, you can as well go for Payoneer referrel program that gives you $25. With all this in place, you might never worry on asking when your Payoneer card will be delivered. As it will arrive even before you know it. If you like this post, dont be selfish. Click on the share buttons bellow to share on facebook, twitter and google+. Your friends might be passing through the same problem.